Mammals, amphibians, reptiles, fish and birds all have backbones. All these animals make up less than 4% of the total animals species. Over 96% of all the animal species on earth are invertebrates. Invertebrates are cold blooded animals that do not have backbones and do not have a skeleton of bone, either internal or external. Some have fluid-filled skeletons, while others have hard exoskeletons, or outer shells. ● Marine invertebrates are ocean animals without backbones, including starfish, sponges, jellyfish, corals and anemones. ● Mollusks have a soft body covered by an outer layer, a mantle. Many live inside a shell. Mollusks include slugs, snails, squid, octopuses and oysters. ● Crustaceans are a type of arthropod, meaning they have jointed legs. Their bones are on the outside of their bodies, like a shell. 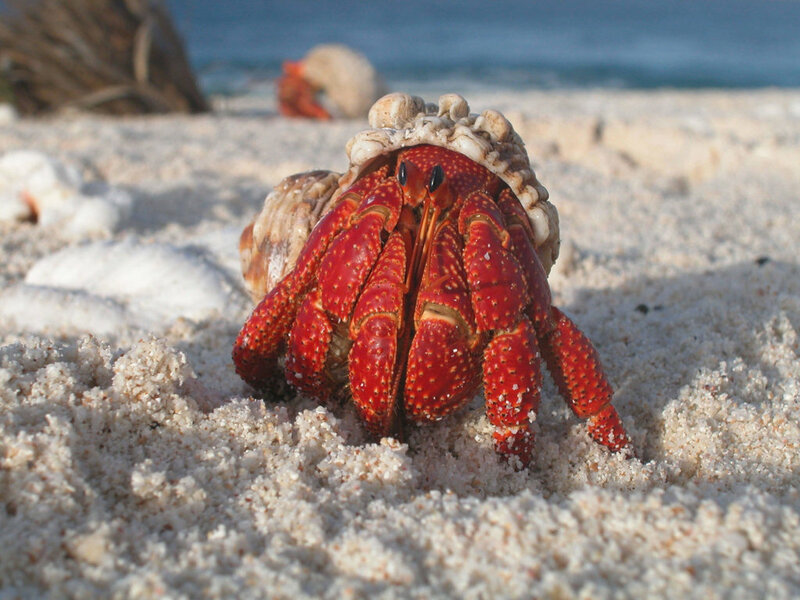 Crustaceans include shrimp, crabs, lobsters and barnacles. ● Worms are invertebrates that don't have legs. They live in soil, water, or inside other animals as parasites. Worms include earthworms, tapeworms and leeches. ● Spiders, centipedes and scorpions are part of the arthropod phylum, but they are arachnids, not insects, because they have eight legs. Centipedes and millipedes are myriapods and have lots of legs. The average home houses 30 spiders. You are always only three feet from a spider. ● Insects make up the largest group of animals in the world, the arthropods. There are over 1 million species of insects. The giant cranch squid is the largest squid species in terms of mass. At over 40 feet long, it is the largest known invertebrate. The longest invertebrate is the ribbon worm which can grow to 180 feet long. The smallest, the wheel animal, is too small to see with your eyes. Tiny mites are the fastest animals in the world when it comes to body size. Clams can live over 400 years. Some corals live even longer. The octopus has a sophisticated navigation system in its brain that helps it navigate complex mazes, as well as stay one tentacle ahead of any opportunist predators. Octopi have been known to solve problems and play together, and have an impressive short-term memory. They have even been known to sneak aboard fishing boats and pry open holds to steal captured crabs, and can open jars. They use shells and other objects to build defense structures against predators. They are capable of foresight, planning and using their tentacles as tools. Octopuses collect bottle caps, attractive stones and other finds from the ocean floor and decorate their dens with them, repositioning an object if it doesn’t seem to suit the design. Spiders are invertebrates but are not considered insects because they only have two main body parts instead of three, eight legs instead of six and no antennae. Most spiders also have eight simple eyes, while insects have large, compound eyes. Some have no eyes and others have as many as 12. Spiders, along with ticks, mites, harvestmen and scorpions, are called arachnida. They are also classified into a special group called araneae because they have very slender waists compared to other arachnida. Most spiders are carnivorous, usually feeding on insects. Some are big enough to prey on larger animals such as mice or small birds. Without spiders, insect numbers would skyrocket and bugs would devour our crops. Most spiders eat about 2,000 insects a year. Some spiders live in silk-lined burrows and leap out to capture prey. Some lie in ambush. Some go hunting in search of prey and others spin webs to entrap them. Some spiders capture prey with silk-made nets, and others use spider silk as "fishing lines". Spider silk is also used to protect their babies, to create shelters and to assist them as they move and reproduce. Some spiders even build "submarines" that hold air so they can stay under water. Most live on land, but a few live in and on water and can run across water. Spider webs are made of continuous strands of spider silk produced from glands under their bellies. Most take about 60 minutes to construct. The webs have three parts: the frame, built first and attached to plants or other objects; the radii, which radiate out from the center like spokes of a bicycle and transmit vibrations from prey; and the catching spiral, the sticky threads that stretch without breaking making it difficult for insects to escape. Small and young spiders can travel for miles on air breezes, a travel method called ballooning. To lure other spiders from their webs, the jumping spider plucks rhythms at the corner of a web to mimic a trapped insect. Some spiders live in complex communities housing thousands of individuals, building large communal webs, working together to trap prey and sharing the harvest.